At the beginning of her turn, Xing Cai can choose any male character. This character becomes her husband. Her husband can ask Xing Cai for attacks and Xing Cai can ask her husband for escapes. 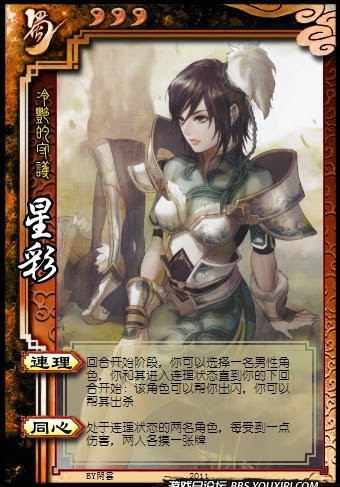 For each unit of damage that either Xing Cai or her husband receive Xing Cai can allow both of them to draw a card. There is a version of Lady Xiahou with similar, but different, abilities. At the beginning of the game, Xing Cai does not have a husband. She must wait until her first turn to use "Interlock". Xing Cai can use "Interlock" with any male. There is no way that they can interfere with being targeted. Regardless of who was damaged, Xing Cai decides if the pair will draw from "One Heart". If she draws a card, her husband cannot refuse.